This complete weather station comes equipped with outdoor sensors that operate on solar power, which provides easy installation. This station also has seven channels and accepts up to three additional sensors. I am not sure what Oregon Scientific is doing shipping this thing without a manual (I mean, what comes with it is not very useful), because in my opinion, the company sells some excellent products for the money. Why then go on the cheap and risk your reputation just because you can't put together a good manual, which might add 40 cents to the cost of each unit when all the costs have been considered (including hiring a professional technical writer)? So I have to wonder who is managing that company. I can imagine the average person who tries to get this thing going is going to spend a lot of time in the physical installation and then, after their significant work, get especially frustrated due to the fact that ultimately, the devil is in the procedural and electronic details. I was lucky and got mine to work right away (I think) but I am used to unraveling trainwrecks. Then I found the Radio Shack manual for the similar item! Do as many have suggested, and get the manual for the Radio Shack version. I am not sure that they still sell this, but you should be able to find a manual on their site or somewhere else by searching for their item # 630-1016. Or for "Radio Shack Wireless Weather Staion". Some people like to make fun of Radio Shack for various reasons, but give them credit for at least understanding THEIR market. Now that mine is installed, I am going to print that Radio Shack manual and see what I missed and maybe actually how to USE it. The bottom line here is that if you can get your hands on a manual, this unit is awesome for 200 bucks. The Oregon Scientific WMR968 is a very inexpensive but complex weather instrument. 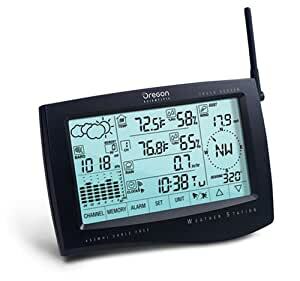 I have been researching home weather stations for over a year now, and just purchased the WMR968 from Amazon.com when the price dropped by half. At the current price it is worth the extra trouble to get it to do what it should do. At this price, you have to expect to do some extra fiddling to get it to perform. If you really want a weather station that is going to perform perfectly, time after time, right out of the box, keep looking. This isn't the one for you. But, on the other hand, for those of you who like me have very little cash to spend on a home weather station, this is a good buy. Only beware! As is noted in these reviews, and on many other consumer review web sites, the manual that comes in the box is trash! Do not use that manual to set up and tune your WMR968. Please, please, please, go to the Radio Shack website and download the manual for the Radio Shack Cable Free Weather Station with AccuWeather, and use that one, it is excellent! The Radio Shack weather station is identical in all respects to the one sold under the Oregon Scientific brand name, except that, for some reason, it has a real manual written by a real American, and it has all the information you need. Note, that the manual that comes with the Oregon Scientific weather station has 9 pages. The Radio Shack manual has 36 pages. My advice: if you decide to take the risk and purchase the Oregon Scientific WMR968 from Amazon.com, like I did, read all the consumer reviews, even the nasty ones. You should know what might happen to you. Gather up as much information as you can. I have found several exellent tips on setting up and tuning the WMR968 on this and other web sites. Another suggestion: join and contribute to a weather station bulletin board, such as WeatherMatrix.net. Share your knowledge and experience with others. Finally, don't be tempted to cut corners when setting up your weather station. The sensitive electronics are not tolerant of abuse. Do your best to make sure everything outdoors is weather-tight. to be fair to Oregon Scientific. I am a meteorologist so I am obviously going to be picky. 5280 ft and the sun is really strong in Boulder, Co, even in the winter! is less than 32F. The useless instructions don't indicate this. very well with the Davis stations in the area. to what the Davis instruments are reading around my house. tendency on the order of 0.10" (about 3-4 mb) at times. This is not great. but I think in the summer this will be pretty good. units but I'm getting used to getting in and out of the sensor quickly.